Forget salted caramel and chocolate sea salt ... those ice cream flavors are so 2015. The latest crazy (but still delicious!) 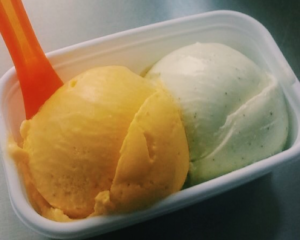 trend in scoops is to use things like vegetables, hot sauce, tea and even shellfish as a flavor base. No weekend is complete without (at least) one stop at the ice cream shop. Which is why we searched the country for the most cutting-edge ice cream flavors around and found a (mostly New York City-based) burgeoning food trend that makes the concept of chocolate chip look positively prehistoric. So the next time you treat yourself, think outside-the-cone with one of these options. Think corn is only for eating on the cob or popping with some butter? It’s time to turn your taste buds on to corn ice cream, which is quickly becoming a dessert scene fad. 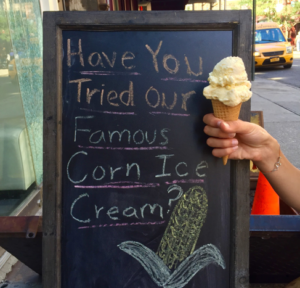 We tried Cones Artisanal Ice Cream in NYC whose version of the corn ice cream (pictured above) we thoroughly enjoyed. Jeni’s Scoop Shop (various locations nationwide) features sun popped corn flavor which tastes like creamy kettle corn on a cone. In a good way. If you’re someone who craves that sweet/salty combo, this may quickly become your go-to flavor. Never heard of ube (pronounced “oo-bay”)? We hadn’t either, until we stopped by 2nd City in New York City’s West Village. Ube is a sweet, purple yam that’s popular in many Filipino desserts. The ice cream tastes a bit like that sweet potato-marshmallow casserole your mom makes for Thanksgiving every year, but dialed down on the sweetness. If you’re not big into sweets but crave a cold treat from time to time, this is totally the flavor for you. 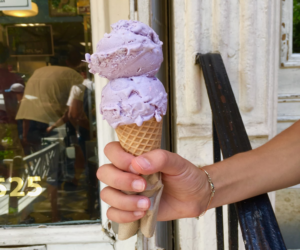 Ube ice cream is a craze everywhere right now, at least partly because its bright purple color is very photogenic. Hello, Instagram! This flavor is definitely not for those who shy from adventure. This over-the-top, under-the-sea treat is made with a butter base and has fresh, buttered local Maine lobster folded into each pint. 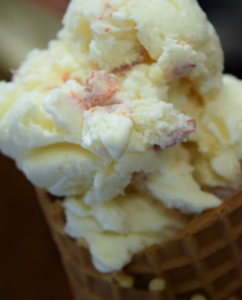 The only place we could find lobster ice cream like this at Ben & Bill’s Chocolate Emporium in Bar Harbor, Maine – which makes sense, as Maine is the go-to spot for fresh lobster in the U.S. Time to plan that road trip to the Northeast! Feeling classy? 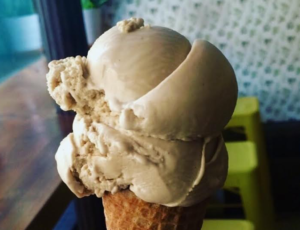 Van Leeuwen’s Earl Grey ice cream will make you feel like you’ve been invited to Royal Tea with the Queen of England. Or at least like you’re having breakfast with your grandma. Van Leeuwen’s creation is so remarkably true to the flavor of the popular black tea that it even smells like the real thing. Outside of NYC, Van Leeuwen ice cream be found in Whole Foods and other major grocery stores in NY, NJ, CT, and CA. If you are one of those people who puts Sriracha on literally everything (you know who you are…) then you need to get your hands on a few scoops of this ice cream from Mason’s Creamery in Cleveland. 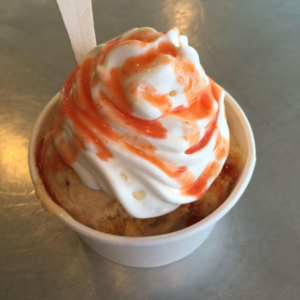 To make the ice cream, they swirl Sriracha candy through roasted peach ice cream, and then top it with homemade whipped cream and a sweet kumquat and Sriracha sauce. And Sriracha-loving vegans will rejoice in the fact that they also offer a dairy-free Vanilla Ice Cream with Sriracha sauce. To make this dark-as-night ice cream, Morgenstern’s mixes coconut ash (the charred remains of a blackened coconut shell) with coconut cream and coconut milk. The overall result is a sweet ice cream that’s surprisingly not too heavy on the coconut flavor. 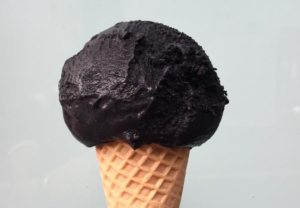 The ash gives the ice cream both its color (shockingly black) and a slightly rough texture. It’s worth the side glances you may get as you stroll down the street with this jet-black cone. We promise.